Enticing preview of Ravi Shankar’s only opera! We enjoyed an illuminating evening launching Ravi Shankar’s only opera, Sukanya presented by the Royal Opera, London Philharmonic Orchestra and Curve. The world premiere of this mythical love story, told through music and dance, tours venues across the UK in May 2017. The opera will open 14 May 2017 at the Curve Theatre, Leicester. International press, Anoushka and Sukanya Shankar and the world of music came together to launch Ravi Shankar’s innovative work at the Royal Opera House, London on Tuesday 20th September 2016. The launch included an introduction from the Associate Director of Opera at the Royal Opera House, John Fulljames, as well as Anoushka Shankar discussing her father’s legacy and presentations by David Murphy and Sukanya Shankar. We also caught an enticing glimpse of the opera with a performance featuring classical music from Susannah Hurrell juxtaposed with Indian percussion. View a highlight of the performance on our Instagram page. Indian music legend Ravi Shankar was working on Sukanya at the time of his passing in December 2012 and envisaged the opera as a truly groundbreaking piece, which will explore the common ground between the music, dance and theatrical traditions of India and the West. Days before what was to be his final surgery, with a project almost finished, Shankar outlined his vision for Sukanya to his longtime collaborator David Murphy. Since, Murphy, composer of the opera, has worked with Shankar’s daughter Anoushka to bring the work to life. Sukanya, named after his second wife, is inspired by a story from the legendary Sanskrit epic of the Mahabharata and tells the tale of her mythical namesake, the princess Sukanya, dutiful daughter and faithful wife of Hindu ancient legend. Sukanya Shankar stated of the project, ‘this opera is a standing testimony to the ultimate in the amalgamation of East Meeting West as natural as can be’. The opera is directed by Suba Das with a libretto by Amit Chaudhuri, choreography by the Aakash Odedra Company and production design by 59 Productions. Beautiful music will be offered with singing by soprano Susanna Hurrell in the title role, bass-baritone Keel Watson, Brazilian baritone Michel de Souza and the BBC Singers accompanied by a 60-strong London Philharmonic Orchestra and Indian classical instruments including the sitar, shennai, tabla, mridangam and ghatam. 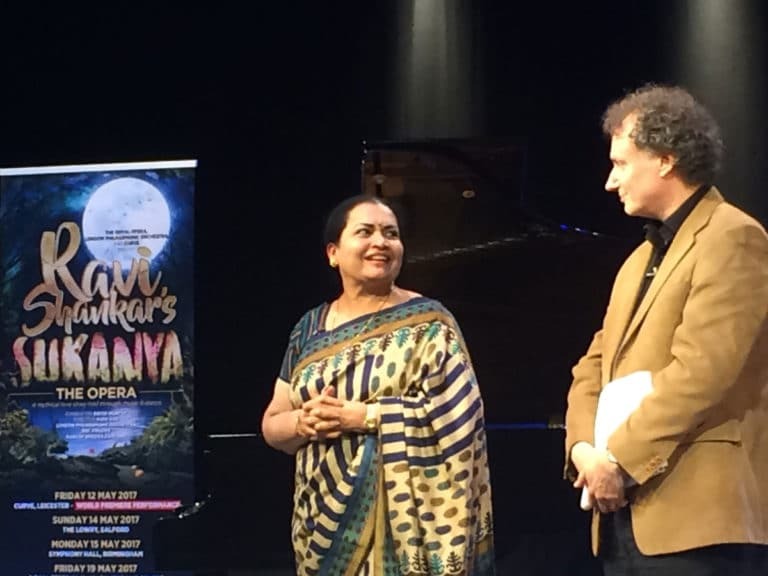 Sukanya is part of the Ravi Shankar Opera Project, which is supported by the Bagri Foundation in association with the Royal Opera House, London Philharmonic Orchestra, Curve Theatre, Leicester and Arts Council England. For more information and to book tickets for the opera visit the London Philharmonic Orchestra’s website.